Something has gone terribly wrong and now you need a co-worker to help cover your tracks. You’re going to have to lie to that person, who in turn will have to spread that lie (unwittingly or otherwise) around the office. You have two choices of co-conspirator; Frank who has a framed photo of his family on his desk or George who has framed quotes about honesty on his desk. Who are you going to pull in to your web of lies? If you’re anything like the participants of a recent UNC’s Kenan-Flagler Business School study, you’re going to go with the family man and avoid George with his moral stand. 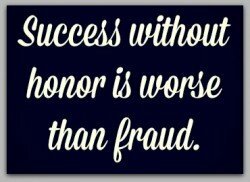 Researcher Sreedhari Desai found that subjects tasked with spreading lies were much less likely to involve people who had the quote “Success without honor is worse than fraud” in their email signature. She also found that participants who were exposed to the quote (as opposed to those who saw neutral quotes or blank email signatures) were less likely to even continue spreading lies. In another, more real-world test, the Professor found that religious symbols had the same effect. In India, office workers who displayed images of Hindu gods or quotes from the Koran or the Bible were generally sparred from unethical requests. What’s fascinating about this study is how little it took to sway a person away from doing something unethical in the first place. Not only did quotes and religious imagery work, but even “morally-branded” T-shirts had participants rethinking the error of their ways. Let’s take this idea to the next level. Suppose your company just made a huge mistake and your CEO is going to offer a public apology. Would we be more likely to believe and accept his apology if there was a quote about truth and honesty on the wall behind him? What if it was just an image of Abe Lincoln? What if your maintenance manager was thinking of falsifying his records to cover up for the days he slipped out early. Would he still do it if he found an honesty quote in his email inbox at the start of every day? If Desai’s findings are true in the real world, just think of all the reputations that could have been saved for want of a virtuous meme. The National Park Service recently announced a very big change in regard to the famous Yosemite National Park. Going forward, many of the familiar buildings and landmarks will have a new name. The Ahwahnee Hotel will heretofore be known as the Majestic Yosemite Hotel. Wawona Hotel will now be known as Big Trees Lodge and The Yosemite Ski & Snowboard Area will substitute for the famous Badge Pass Ski Area. While it may seem that the change was designed to capitalize on the SEO value of the keyword Yosemite, it’s actually the unwelcome response to an ugly lawsuit; a lawsuit that should have every business owner tightening the reins on their own names and trademarks. The National Park Service owns and manages the actual land within its borders. But the hotels, the activities, sightseeing tours, souvenir shops and snack stands are all operated by a private company. In the case of Yosemite National Park, that company is DNC. They’ve had the concessions contract since 1993, but on March 1st, they’ll be handing the keys over to a new company. When DNC found out that they had lost the contract to a new company they brought up a point they’d neglected to share. They’d trademarked the now famous names of the park’s hotels, hills and tourist attractions. They even got the merchandising rights to the phrase “Yosemite National Park”. They’re happy to turn over the trademarks to the new concessionaire in return for a fair price – $44 million. The US government says the actual value of those trademarks is more like $3.5 million. And that might be the case once they get done changing every sign, brochure, T-shirt and postcard in the area. How valuable can the name “Ahwahnee Hotel” be if it doesn’t exist anymore? Since the park service has chosen to rename the iconic properties it would appear that they have no intention of buying the trademarks from DNC. But here’s the rub. Legal analysts say the new concessionaire will likely have to pay up because buying out the previous owner of the contract is part of the deal. 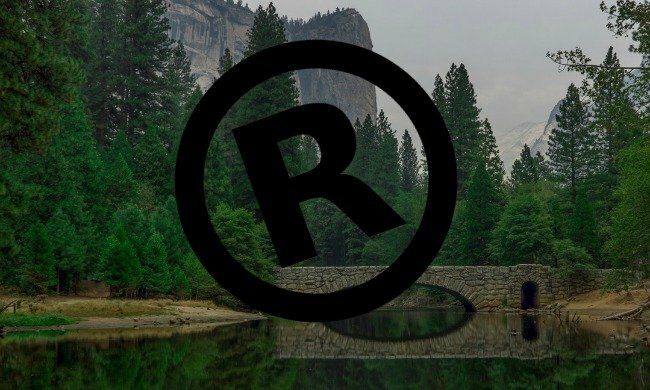 If that happens, the National Park Service still won’t own the rights to the old trademarks. Those rights will go over to the new concessionaire. Hopefully, the Park Service has learned a lesson and has already laid claim to the new names that will go into effect on March 1. This entire case is particularly odd because it involves a private company owning the names associated with a public landmark. But that has to make you think. If this can happen to one of the nation’s most well-known parks, it can happen to you. The key to protecting yourself from a trademark hijack is always staying ahead of curve. What products are you developing? What advertising slogans do you plan on using in the coming year? What images? Without a crystal ball, it’s tough to say which of those names and phrases will need protecting but putting in the due diligence before a name or phrase takes off is always better than fighting it out in court later. You might have right on your side but can you afford a lengthy legal battle? Once you’ve secured a trademark, it’s a good idea to conduct regular Google searches for anyone else using the words. Two companies can have the same name but if they’re in the same business you might have a case. What you’re really looking for are people who have co-opted your trademark for the purposes of misleading customers or slandering your company. Popular companies and celebrities run into this all the time on social media. Twitter will back a company if it can prove that another Twitter handle is causing confusion. The injured company can then take control of the offending account or have it deleted. The case of the public park vs the angry concessionaires happened because one side saw the value in the collection of names and phrases while the other party naturally assumed they had control. Who’s in control of your product names, images and oft-quoted phrases? If it’s not you, open a new browser tab right now and find a trademark lawyer. If you’re worried about the cost, think about how much Yosemite is going to have to pay to have every sign, brochure and souvenir reprinted. Studies have shown that a kind word about a brand from your friend is much more likely to turn you into a new customer than a paid advertisement. It’s a question of trust. Our friends wouldn’t recommend a product or business if they didn’t truly like it. The trick for brands is finding a way to leverage impromptu recommendations and push them out to a wider audience. Twitter has a couple of ideas on this that could end up as either an advertising goldmine or the latest #PRFail. Earlier this month, Twitter launched a beta test of their new Conversational Ads. These ads combine an interactive poll with a Twitter recommendation. Each ad contains a question and two hashtag call-to-action buttons. When a Twitter user taps one of the buttons, the Tweet composer opens with a pre-filled brand message including an image and the two original hashtag options. If the user chooses to publish the post, it appears on their timeline. Instant friend-to-friend recommendation. As an added bonus, the advertiser is only charged for the first viewing; the shared media is a free bonus. At the end of the process, the original clicker also gets a thank you note from the brand. Which is the least the brand can do in return for free advertising. Certainly, there’s a percentage of Twitter users who will delete the pop-up post but a large number of users will click to share because it’s easier. Technically, that intentional click equals explicit permission but we’re still walking on shaky ground. Remember those FTC rules that say all online ads have to have a clear and conspicuous disclosure? Use disclosures in each ad. If a disclosure is required in a space-constrained ad, such as a tweet, the disclosure should be in each and every ad that would require a disclosure if that ad were viewed in isolation. Do not assume that consumers will see and associate multiple space-constrained advertisements. Short-form disclosures might or might not adequately inform consumers of the essence of a required disclosure. For example, “Ad:” at the beginning of a tweet or similar short-form message should inform consumers that the message is an advertisement, and the word “Sponsored” likely informs consumers that the message was sponsored by an advertiser. Other abbreviations or icons may or may not be adequate, depending on whether they are presented clearly and conspicuously, and whether consumers understand their meaning so they are not misled. Misleading a significant minority of reasonable consumers is a violation of the FTC Act. Looking at the graphics provided by Twitter, the original call-to-action ads have the word “promoted” at the bottom. But the shared Tweet does not. I suppose the shared Tweet isn’t the same as a sponsored ad but it’s still a Tweet generated by the brand. Do the FTC guidelines apply or not? How about in this case. .
Twitter gave advertisers an early look at related product they’re calling the “brand enthusiast gallery.” The Twitter bots will scour the Twitterverse to find and catalog positive brand mentions from average people like you and me. The bot will then direct message said persons and ask their permission to reuse the Tweet on the brand’s account. If they say yes, the Tweet goes into the gallery and the brand can then reTweet any or all of the Tweets through their own feed. There’s nothing to stop a brand from doing this right now, so the concept itself isn’t revolutionary. Twitter is simply making it easier by putting the Tweets in one place. Also, since Twitter is asking permission, not forgiveness, that should keep consumers from complaining about any co-opting of their words. Will the shared testimonials come with an ad disclosure? Probably not, because technically, these Tweets are unsolicited positive comments. The Tweeter doesn’t expect and isn’t going to get any compensation for being a nice person. Disclosures and permissions aside, both of these advertising products come perilously close to invading customer privacy. We could say that when people post to a public forum, they can’t expect their words to be kept private but they often do. I’m in the business and I’m still surprised when a brand replies to an off-handed Tweet I never thought anyone but my followers would see. It’s like griping about a bad flight and getting an apology Tweet from every major airline. Both of these ad products have the potential to be good money-makers for Twitter and easy reputation boosts for brands. That is, if the majority of Twitter users play along and don’t object to their words being used as free advertising. Holly in Indianapolis would like to reset the clock after leaving nasty feedback about her New Year’s Eve pub experience. She went to Kilroy’s Bar and Grill to welcome 2016 with friends, food and plenty of drinks. Sadly, the party was interrupted by paramedics who had to perform CPR on a patron on the floor of the crowded bar. In the middle of the hubbub, Holly decided it would be a good time to dispute some of the charges on her $700 tab. The manager told her that “someone dying was more important” than her being there which made her feel like her “business didn’t matter”. Imagine! 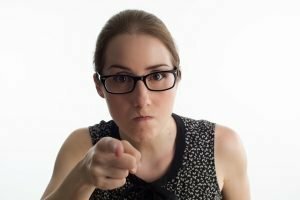 The nerve of the manager to put human life in front of customer service! The next day, Holly left a long, angry rant on Kilroy’s Facebook page which was quickly followed up by an equally ranty – though much more understandable – reply from the bar’s manager. He goes on to explain that the “overdosing junkie” in Holly’s complaint was a 70 year-old woman having a heart attack. Then, as these things do, it went viral. Conventional wisdom says it’s never smart for a business to publicly attack a customer but in this case it worked in Kilroy’s favor. People all over the world rallied behind the bar and its crew who – let’s face it – all had a pretty lousy New Year’s Eve. But you know what happens when you rile up the social media watchdogs; they attack. So in addition to kind words for Kilroy’s, it’s been two days of bullying and threats for Holly and not just in cyberspace. The salon where Holly works has been getting bombarded with callers pushing to get her fired. Even women with the same name who live in the area have been feeling the heat. Now that it’s over and done, it’s time for some Monday morning quarterbacking. It’s hard to say what any of us would do in the heat of the moment. This is business but we’re all human and this is the way humans respond when we’re the subject of an unjustified attack. But in most cases, these things are better dealt with in private or not at all. Or perhaps a simple, clear-headed response stating the facts and nothing more? This time, it was a win for the establishment. Kilroy’s gained some reputation points and they’ll probably see an increase in business throughout the month. But right now, I think everyone involved is ready to have this over and done with. The one spec of goodness to come out of this whole affair is the outpouring of good wishes and financial support for the real victim here; the woman who had a heart attack in a busy pub on New Year’s Eve. The CW is the smallest of the four, major television networks but they have something those others don’t have — a tight-knit group of very loyal, very vocal fans. With the combined power of the Supernatural, Arrow, Vampire Diaries, and The Flash fandoms you could build an orphanage, clean-up an ocean or launch a boycott that would make even a seasoned network exec beg for mercy. Looking for inspiration to keep the weight off during the holidays? The Victoria's Secret Fashion Show should do it, and it starts NOW. Unlike Bloomingdale’s holiday misstep, it’s easy to see how this one got past the gatekeepers. How can you eat cake when you’re watching Victoria’s Secret models parade around in their underwear? It’s a shared thought that we can all relate to. . . isn’t it? Apparently it was for at least 71 people who gave this Tweet some love. That doesn’t begin to balance out the angry CW fans who responded with a barrage of clever but angry gifs. This one fought back with a line pulled right out of the CW’s Supernatural. Even Supernatural recurring guest star Kim Rhodes took her employer to task with a healthy, even-tempered response. I’m pretty sure that the person who wrote the offending Tweet was just trying to be clever. I don’t think he or she meant to imply that all women should be model thin. Or that losing weight is always as simple of just giving up holiday treats. But this is a new day. The social denizens are always on the lookout for branded bullying, insensitivity and inappropriate responses and when they find it, they show no mercy. Sadly, the offended don’t feel the need to live by the rules they set for others. Quite a few of the responses in this case contain foul language and images of people giving the finger. Some even posted violent messages. If we’re all going to get along then we need some understanding on both sides. In the future, I’d like to see people respond to a Tweet like this with body-positive messaging and facts rather than anger and hate. On the other side, social media marketers need to take more care when crafting their social media campaigns. If there’s even a chance your words will be misconstrued, don’t run it.